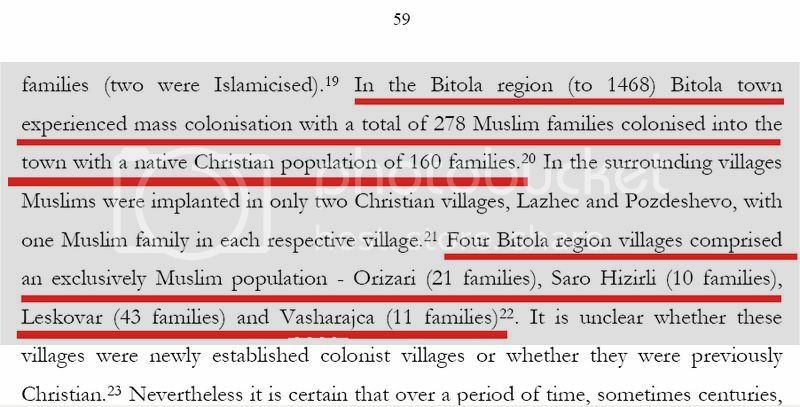 In the surviving Ottoman documents of 15th and 16th century, the vast majority of Skopje’s inhabitants were Ottoman Muslims who identified themselves, mainly as Vardarians, Albanians, Turkomans, Karamanlis, Kurds but never as Macedonians. The history of Skopje ( known back then as Uskub) during Ottoman Period remains unknown in its largest part. 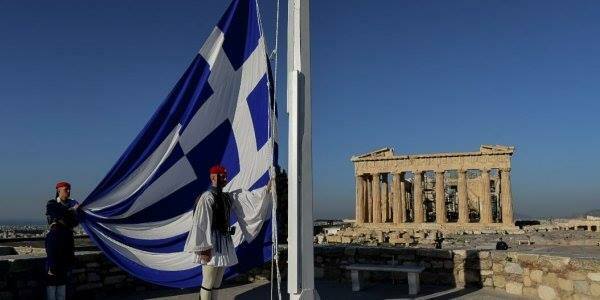 Few researches have been fulfilled about the Demographic and Political situation of the city during that Period. Those who stand out are the ones of the Turkish Academic Inaltzik and the Historian’s Fraenkel. From the research of the latter, we have the opportunity to study Ottoman documents of the period 1450-1550 like defters. 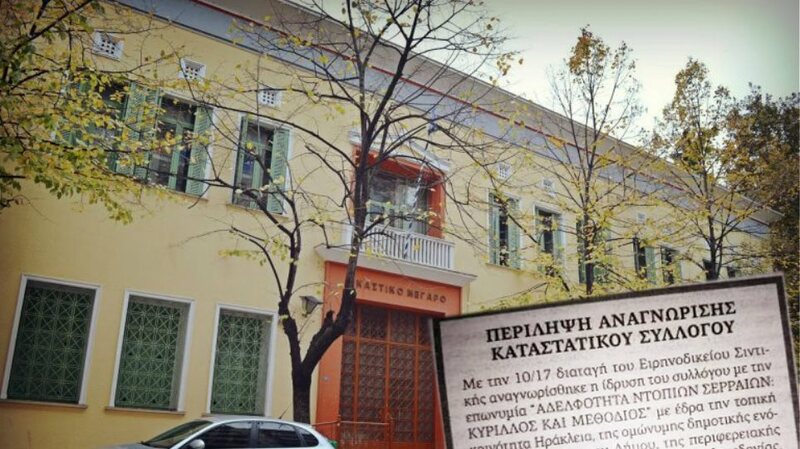 Defters were cadastral tax census carried out by the Ottoman Empire. The defters collected information about villages, dwellings, household heads (adult males and widows), ethnicities and subsequently registry. 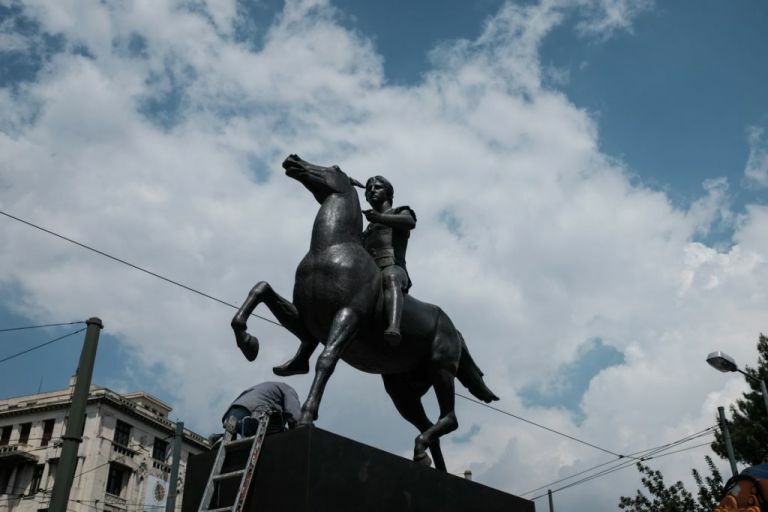 In order to have a more clear view regarding the Identity of Skopje’s population, we have to keep in mind that the city comprised of a populace from different ethnicities. 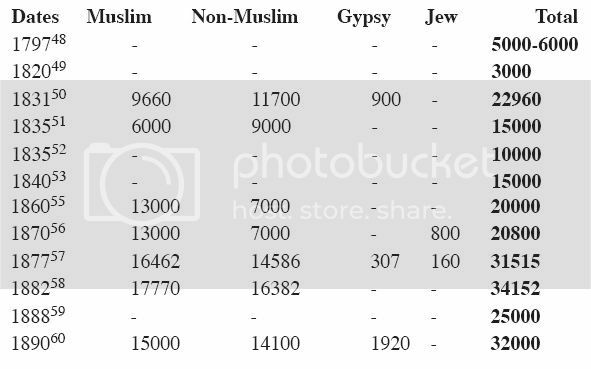 The predominant element of the population is Ottoman Turks (See related Table) with origins from Anatolia. 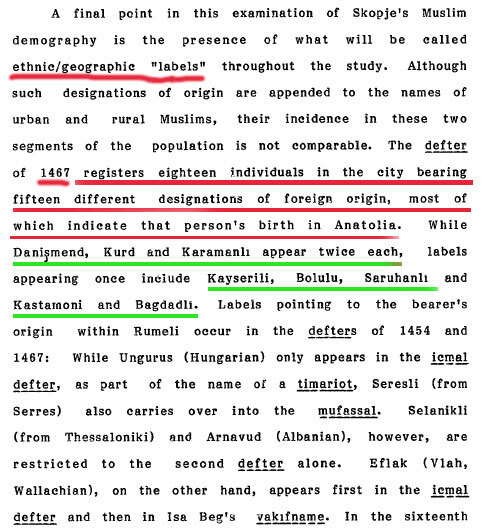 Its characteristical the fact that there is a significant percentage of Skopje’s Population who identify themselves as Kurds (Kurd), Turcomans (Danishmend), Karamanlis (Karamanli) and other geographical identifiers from cities of Anatolia. (Konyali, Bagdad, Kayserili, Bolulu, Saruhanli κ.α.). 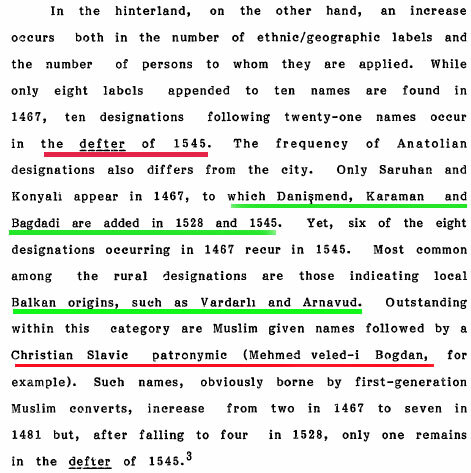 Those inhabitants who originated from the nearby places identified themselves mainly as Vardarians or Vardariote Turks (Vardarli) and Albanians (Αrnavud) which were the most widespread self-identifications. 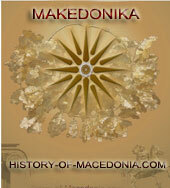 Of course the term “Macedonian” is nowhere to be found. 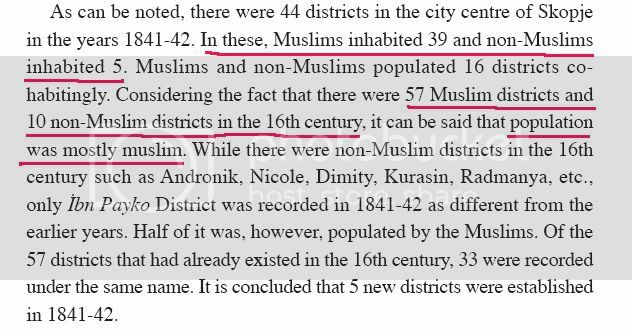 Its impressive the great number of the city’s population which was islamized and surpass 30% in many occasions. 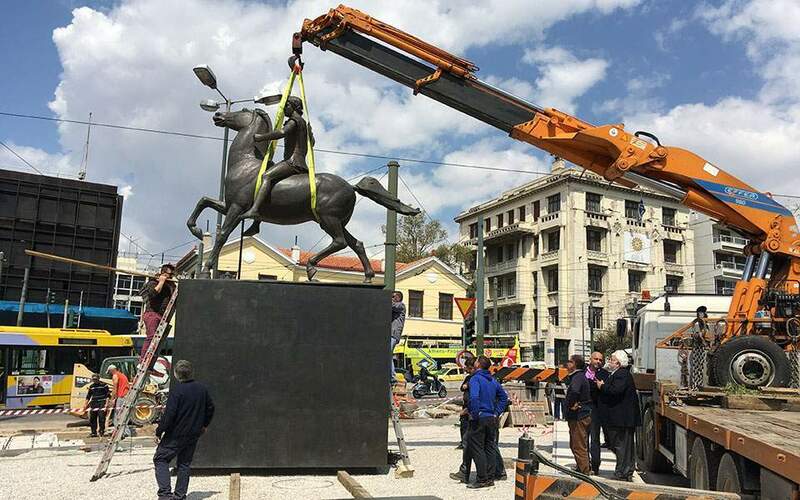 “Such places as Serez, Plovdiv, Babadag, Elbasan, Sarajevo, Silistre and Skopje had been rearranged by the uc-begis in such a way to be new Turkish cities“. Naturally Skopje and the areas close to Stip was settled by Ofcabolu Yoruks. The Serbian speaking Catholics in Skopje were converted to Islam and mixed with Ottomans. The Muslim colonization as we already analysed consisted of Turks and Turkic people arriving from Asia Minor and Anatolia. The intense Albanian colonisation started from the end of the 18th century throughout the first half of the 19th century and from that time to a lesser degree to the end of Ottoman rule. Its indicative that Skopje in certain periods like during the years 1841-42 was an ordinary Turkish city. 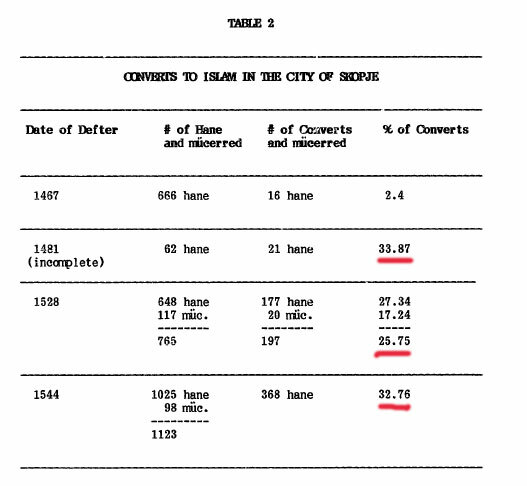 A table with numbers making explicit the population of Skopje during 19th cent.